We attended this concert, part of the ‘Kick the Dust Up’ tour, on October 18th 2015 but I only just got around to writing this review. Luke Bryan is an American country music singer and songwriter. Luke was the recipient of the Academy of Country Music Awards and Country Music Association Awards ‘Entertainer of the Year’ award and has sold over 7 million albums and 27 million singles worldwide. One reserved ticket in the first 20 rows of the Lower Bowl – we were in Section: ORCH 2 Row: V Seats: 208/209 – you’ll be able to see from the video how close this is. Invitation to exclusive ‘All My Friends’ Lounge with cash bar. 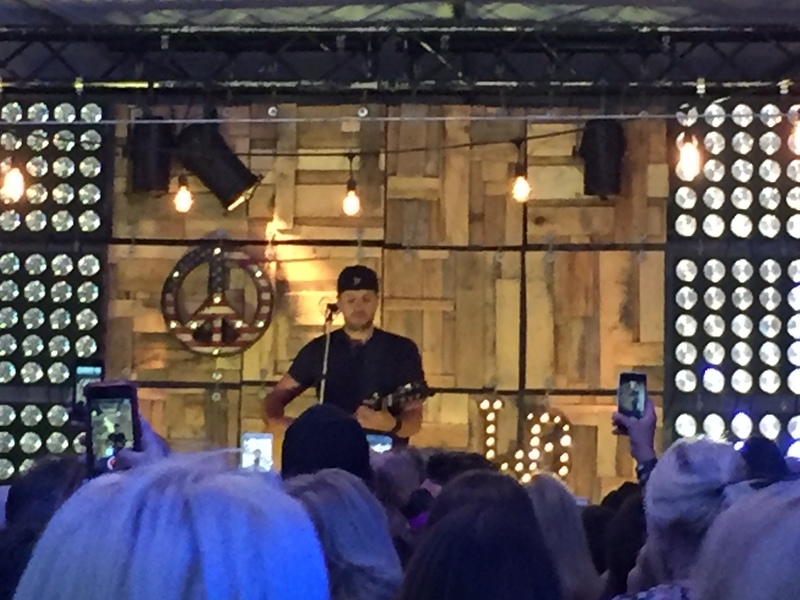 Two song acoustic pre-show performance by Luke Bryan. One limited edition Luke Bryan poster. 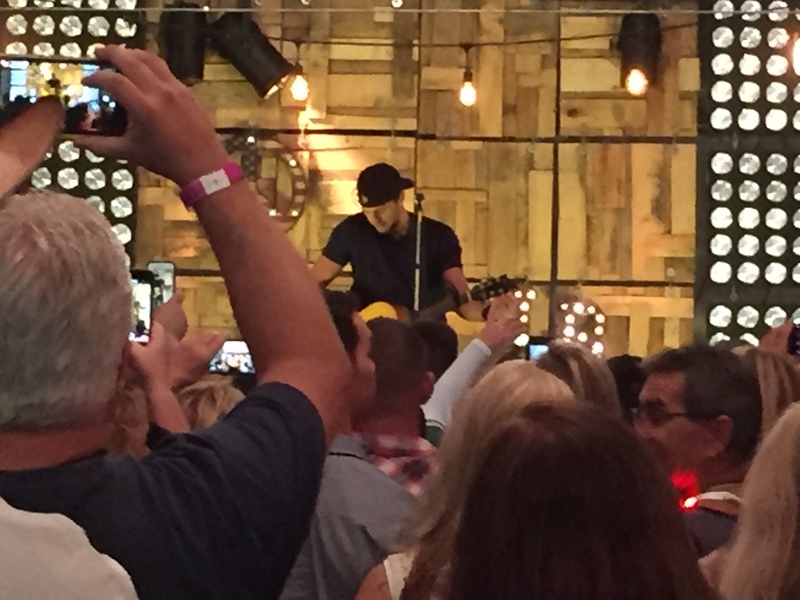 One Exclusive Luke Bryan Merchandise Gift. Total including fees from the vendor $461.50. I was disappointed that the ticket didn’t include preferred parking as I’d read stories about lines at Irvine Meadows Amphitheatre. So I purchased preferred parking separately for $40. The odd part was that the ticket said ‘will call’ and I wondered what would happen with this chicken and egg situation. We flew Virgin Atlantic into Los Angeles on the 17th, picked up a rental car and drove to the Wyndham in Costa Mesa (a short drive from Irvine). The weather – a perfect warm California evening. We arrived a few hours before the concert and there was already a line of vehicles waiting, plus plenty of people already parked up with lawn chairs and cool boxes. We headed for preferred parking. The guy wasn’t too happy about our printed out email and there was a small discussion about whether we should be allowed in. But the combination of large SUV, English accents and a line behind us meant we were allowed in. It was only a short walk to the ‘VIP will call’ table – yes it was a table with a plastic gazebo and two people handing out tickets. There was a line for this that took maybe 15 minutes. Things improved once we had our VIP laminates on lanyards. We were taken by an open-sided cart to a large tent that was set up as the ‘All My Friends’ lounge. There we were given a small cool bag, souvenir cup and a poster. The ‘lounge’ tent had a small food buffet, free bottles of water and a pay bar. I purchased a large Jack Daniels and I think it was $16. After Luke came off stage the VIP crowd were led to the main amphitheatre. The place is huge and mostly open to the elements – I’m not sure what happens if it rains – well apart from that people get wet! The great thing about the show was that it wasn’t just Luke stepping through his song catalogue – instead he really engaged with audience, chatting, telling stories and hanging out with his pals on stage. When the concert finished we followed the crowds back to the exit. We hadn’t realised that there were numerous side shows and bars around as we’d been in the VIP tent. There was a line of cars trying to escape from the parking lot. Getting out of preferred parking took about 15 minutes – the main lot a lot longer I would guess. We really enjoyed the show and Luke definitely deserves the ‘Entertainer of the Year’ award. I’d recommend VIP tickets and preferred parking if you can afford to do that.